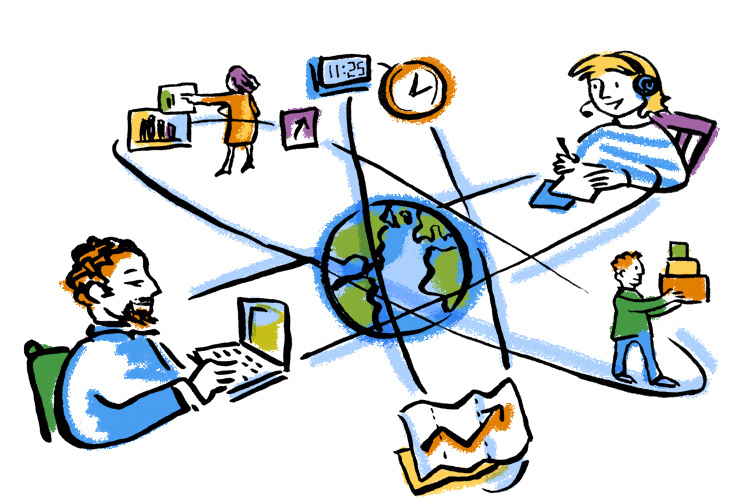 Can a Distributed Team Work for You? If you’ve ever been part of, currently manage, or are looking to set up a virtual team, you may be wondering whether working remotely is worth the effort. There’s a lot being said and written about how this modern way of working is not for the faint-hearted. Why, then, are virtual teams so popular? And could they potentially be a part of your business’s future? I’ll go through some of the benefits of investing in these types of work teams, as well as common challenges and possible solutions. You’ll also see how two companies have built their brands around a core belief that virtual is best. Statistics show that 50 percent of the U.S. workforce has a job that lends itself to teleworking arrangements, and 3.7 million people work from home at least half the time. That’s a lot of people in—or who at least have the potential to be in—a non-traditional working environment. One benefit of managing a team made up of people from around the world is the cultural diversity the business naturally acquires. Gaining access to not only differing perspectives and approaches to problem-solving but also subject matter experts across a range of industries is something many business owners can only dream of. As the saying goes, knowledge is power. So, why limit your knowledge base to a single city, country, or continent? When you widen the net and look beyond your existing recruitment bounds, you’ll suddenly open up a world of possibilities when it comes to finding the right people for the job. With no need to relocate their families, find new schools for their kids, or endure the daily commute, you’ll attract workers who want to be part of a team that loves what they do. Next to labor costs, one of the largest operational expenses of the traditional business is office rent and related overheads. If you’re a global business, no doubt you’ll also be feeling the pain of rising travel and accommodation costs. Sure, making the decision to go virtual may mean an initial investment in collaboration and communication software. But it’s worth it when you weigh it against conventional business costs. Not having to endure the commute to a physical workplace each day is a major plus for many workers. It doesn’t just benefit workers, though. When you consider that the average commute in the U.S. is more than 25 minutes, that’s a lot of time potentially saved each day. Your employees could be focusing on important tasks instead of sitting in rush hour traffic. Another bonus to working across multiple time zones is the ability to operate your business 24 hours a day, meaning you can be more responsive to customers. Being a teleworker can be extremely isolating, and with no one standing over their shoulder, it can be easy for employees to become disengaged. Quite often, there is also the perception that office workers are given preferential treatment. Out of sight, out of mind. Reward performance: If only part of your workforce is centrally located, it’s more important that ever to implement a reward system that doesn’t discriminate based on location. Forget five o’clock drinks or lunch at the local restaurant. Consider alternatives such as sending e-certificates or acknowledging employee performance during regular meetings. Meet face-to-face: While it may not be practical to meet in person on a weekly or monthly basis, try to ensure the initial meeting is face-to-face. This sends a message that you care about your employees and serves as a reminder that they are contributing to a real business and a real team. It will also help strengthen the bond between team members, giving them a sense of belonging and that they are working toward a common goal. Most managers would agree that dealing with conflict is one of the most difficult issues to deal with when leading a team. The added challenge with virtual teams is that the ability to talk issues through face-to-face with co-workers is lost. Keith Ferazzi, author of “Who’s Got Your Back,” writes that working in a virtual environment is a “double-edged sword.” On the one hand, employees are more task-focused and aren’t hanging out at the water cooler, moaning about how John forgot to call the client back. On the flip side, it’s much more difficult for employees to empathize with each other when not face-to-face. Nip disagreements in the bud by fostering a culture of honesty and open communication. Encourage the use of online discussion boards or live chat software to resolve issues instead of allowing them to fester until the next team meeting. The benefit of having access to a global workforce also presents a potential hurdle—those dreaded invisible time zones. It’s a phenomenon that impacts global businesses, to the point that someone based in Australia (yours truly), doesn’t share the same working day as someone working on Pacific Standard Time. If you find yourself in a similar situation, it’s inevitable that team members will have to endure the occasional out-of-hours video conference or phone call. To ensure that the same people aren’t having to dial in at 2 am every time, create a schedule with meetings at different times. Another tip—avoid having team meetings on Fridays. If you’re in the U.S., your employees in New Zealand won’t be too appreciative of giving up part of their Saturday. How many times have you received an email typed all in caps and made an automatic assumption based on the “tone” the sender has used? When the majority of business communication is written—as is often the case with virtual teams—messages can easily be misinterpreted. How can you overcome this? First, avoid writing in caps at all costs. More importantly, set clear expectations. By establishing a code of conduct from the outset, you’re laying the foundation for how team members should work together and interact with one another. Employees know what is expected of them and what to expect from you as their manager. Everyone is on the same page. Do you want all communication to be via email? Would you like for team members to respond to requests for information within X number of days? Put it in writing. This way, you’ll minimize confusion, and employees will appreciate the guidance. Help Scout is one company that has found success because of its commitment to a virtual working environment, not in spite of it. Help Scout’s approach to virtual teams may seem extreme, but it works for them. Even the “About” page demonstrates their commitment to hiring team members based on talent, skill, and diverse perspectives, as opposed to geographical location alone. Another globally-distributed team is Zapier, a startup offering a web automation app. Wade Foster, co-founder and CEO, has written an entire document on how the company successfully operates as a remote team. What’s their recipe for success? Team, tools, and process. Just as with Help Scout, Zapier hires team members that have the willingness and ability to work remotely. If potential hires write well and are self-motivated, that’s a good start. Difficulty trusting people or need constant social interaction? Not so great. Zapier uses web-based tools and processes to stay organized and keep employees engaged. They have weekly team meetings—or “hangouts”—and monthly one-on-ones to allow each team member the opportunity to raise concerns and give regular feedback. Can a remote team work for you? Once you recognize that—just as with centralized teams—there will be challenges, you can overcome them. Remote working isn’t for everyone, but as you can see, many companies thrive in that type of working environment. Whether you run a business with a completely virtual team, zero virtual team, or something in between, think about the challenges you’re facing right now. You’ll be surprised just how similar the requirements are for leading effective teams, dispersed or otherwise. You need employees who are engaged, feel valued, and are working toward a common goal. This begins with strong leadership and setting clear expectations from the start. From your experience, what is the number one challenge when it comes to managing remote teams? Have you been successful in overcoming this particular hurdle? If so, I’d love to hear about what worked for you and what lessons you learned.